As a Principal at Trusted Advisor Associates, I develop and lead our workshops and webinars. My goal: to spark the “aha moment” that fundamentally alters the trajectory of a business relationship. 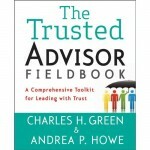 I am also the co-author, with Charles H. Green, of The Trusted Advisor Fieldbook, published October 2011 by Wiley, and the founder of The Get Real Project. I’m a former information technology consultant who has spent more than 20 years managing projects, working with clients, and facilitating groups of all kinds and sizes. Working out of Washington, D.C., I have a BBA in Computer Information Systems, a MS in Organization Development, and certifications in team building and action learning. I have led learning programs and consulted with Accenture, Blackboard, Deloitte, Great-West Life and Price Waterhouse Coopers, among others. I was at lunch with the Managing Partner of a successful boutique firm in Washington, D.C. My colleague and I had just begun a large project involving 360-degree feedback on all of his leaders. Midway through the meal we discovered a big disconnect in expectations. He thought he would have access to each person’s detailed feedback, which we couldn’t provide because of confidentiality — something we thought we had communicated clearly, but apparently hadn’t. He was angry when I raised the dilemma. I told him as respectfully as I could that we would regretfully abort the project — well underway and paid for in advance — rather than compromise confidentiality. He reluctantly agreed to continue. While I felt the project as a whole was moderately successful, on a relationship level I felt it was a failure. My key takeaways: stand up for what you believe in, in spite of how it might feel in the moment. And don’t rely on your own assessment to judge the quality of your relationship with someone. Trusted Advisor and Trust-Based Selling programs. I also train and coach others to lead these programs. And I speak on strategic topics such as customer intimacy, client loyalty, the dynamics of influence, dealing with conflict and developing business with trust. Charlie said you would be a great match for our group and he was absolutely correct. You fulfilled every expectation we had for the two-day experience. Your skills and knowledge around Trust-Based Selling and The Trusted Advisor are clearly in your DNA, and your facilitation of our group–the top 35 leaders in our organization–was masterful. I saw so many people who had light bulbs going off over their heads, even those with dozens of years of experience who are already very good at what they do. Thank you for your personal commitment to us as an organization, and as leaders. I have no doubt that this program is going to make a significant difference for our business for years to come. The facilitator (Andrea) was world class. The Being a Trusted Advisor program was simply excellent. Andrea really guided us through this process and made the experience thought-provoking and comprehensive. I completely benefitted from this course and have already started using the tools I have learned.